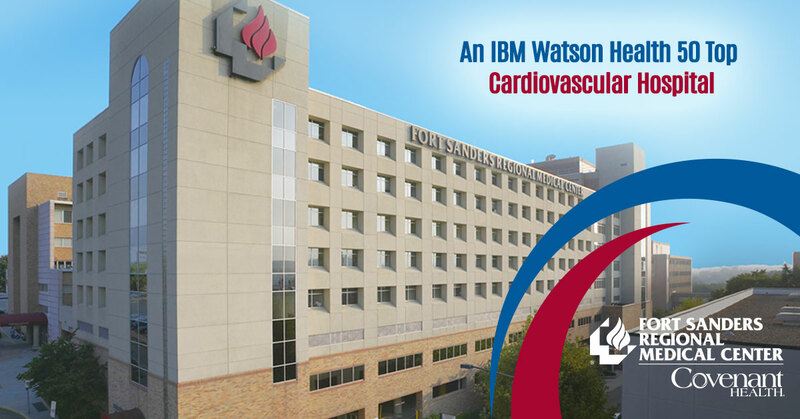 KNOXVILLE, TENNESSEE – Fort Sanders Regional Medical Center is pleased to announce it has been named as one of the nation’s 50 Top Cardiovascular Hospitals by IBM Watson Health. The annual study, conducted by Truven Health Analytics, part of IBM Watson Health, identifies the top U.S. hospitals for inpatient cardiovascular services. The study uses a balanced national scorecard of hospital performance metrics to identify the highest performing cardiovascular service lines in the nation. This study is part of the Watson Health 100 Top Hospitals program and uses rigorous processes to calculate and measure hospital services, leveraging industry-leading, risk-adjusted methodologies developed and maintained by IBM Watson Health scientists. The 100 Top Hospitals study is widely regarded as the leading program for evaluating leadership impact in a hospital, as well as for evaluating quality indicators and efficiencies. Fort Sanders Regional Medical Center’s Heart Center offers comprehensive cardiovascular services spanning the continuum of heart care. From testing to cardiac rehabilitation, Fort Sanders Regional’s advanced diagnostics, interventional technologies, cardiovascular surgeries and clinical trials serve some of the most complex cardiac cases in the region. The Watson Health 50 Top Cardiovascular Hospitals study measures attainment in key performance areas: risk-adjusted inpatient mortality, risk-adjusted complications, percentage of coronary bypass patients with internal mammary artery use, 30-day mortality rates, 30-day readmission rates, severity-adjusted average length of stay, wage- and severity-adjusted average cost per case and CMS 30-day episode payment measures. The study has been conducted annually since 1999. More information about this study is available at 100tophospitals.com. Fort Sanders Regional Medical Center, a member of Knoxville-based Covenant Health, is a 541-bed regional referral center for neurology, neurosurgery, orthopedics, oncology, cardiology, obstetrics and rehabilitation medicine. For more information, visit www.fsregional.com.